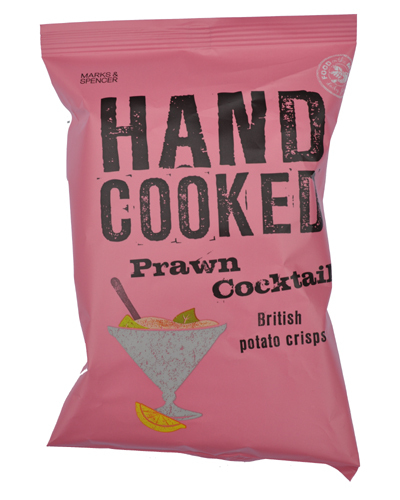 Like the other flavours in the Hand Cooked range produced under private label for Marks & Spencer, these Crisps had a really good crunch that deteriorated at just the right rate. Some Hand Cooked Chips don't melt at all. These Crisps turned to mush at a well timed last moment. There were lots of curly and irregularly shaped Crisps in this bag. There were a fair few with skin on edges. There was also a nicely even coat of reddish coloured seasoning. A Nose Plunge Test revealed a spicy tomato based sauce aroma. Prawn Cocktail is an odd one for our Testers. None taste like Prawn Cocktail, so we are left to compare with other flavours of this variety. Maybe this is why, as a flavour variety, it is fairly peculiar to the UK. There was a mildly sweet and spicy background to a tomato and onion dominated mix.